While completing this week’s reading I got excited about the “Don’t Move, Improve” community revitalization campaign that was mentioned in the excerpt from Towards Sustainable Communities. This campaign was a grassroots community response to white flight and urban decay in the South Bronx. Residents and local activists united to address issues of healthcare, daycare, economic education, housing, the environment, transportation, and development. Since its inception, the campaign has successfully channeled millions of dollars of investment into the South Bronx community. In addition, the campaign has aided in the construction of thousands of affordable housing units and financial assistance for local small businesses. The revitalization of PS 64, formerly a public school building in the South Bronx, is an example of how successful this community group was in their efforts to restore the South Bronx. Residents and non resident cultural groups organized with the non profit organization CHARAS, to reclaim, restore, and revitalize the PS 64 school building and turn it into a community and cultural center, which they called El Bohio. The creation of El Bohio Community and Cultural Center is one of many other visible products of the “Don’t Move: Improve!” Campaign. This campaign is an example of how residents can use grassroots organizing to create a sense of community. As it is explained in Toward Sustainable Communities, creating a sense of place and developing connections between people in a community involves ensuring that the physical environment brings people together and creates a peaceful, secure community that residents can be proud of. The “Don’t Move: Improve!” campaign got residents involved in improving the physical environment in their community, which created a sense of place that went missing after the financial resources relocated to the suburbs and left the South Bronx to suffer in urban decay. With community and cultural centers as well as locally owned small businesses, residents could be proud to call their South Bronx community home. Furthermore, by investing in the community, residents and community groups have insured that the streets are safer and more peaceful. Revitalized and restored buildings replace spaces that can be potentially used for illegal and dangerous activity with spaces that encourage healthy cultural and community activity. El Bohio Community and Cultural Center in the South Bronx is only one of the many buildings that the “Don’t Move: Improve” campaign has restored. This community revitalization campaign was particularly interesting to me because I think that it incorporates much of our discussions about the importance of grassroots organizing. Furthermore, as a resident of the South Bronx myself, I think that these examples of successful community grassroots organizing are extremely relevant - I think that its pretty clear how this example applies to my own neighborhood. With this campaign, residents were empowered by the opportunity to take control of their community. Residents and non-resident cultural groups reenvisioned their community and then they took action. They not only changed the physical character of the community, but they also changed developed a healthy sense of place within their community. This case study reiterates the undeniable fact that community development, restoration or revitalization works best when the actual community is involved. Who can better dictate what a community should be then the people who live in it? It is probably impossible to write all of the ways that the city of Buffalo, NY could be helped/changed based on the tools and examples presented in Apollo Alliance’s “Create High-Performance Buildings,” Toward Sustainable Communities’ “Housing and Community Development,” and Beatley’s “Building Ecologically: Designing Buildings and Neighborhoods with Nature in Mind.” The themes of affordable housing and having a new skilled labor force resonate especially for Buffalo. Firstly, after the steel industry failed/ended/left Buffalo, the labor market was essentially destroyed. By updating building codes, providing training programs and supporting/endorsing the newer green technologies that require specific skills, the local government could improve the employment situation immensely. As the city is in a constant state of renovation and development, thousands would be employed in the fields of “green-standards” construction and design, and development and maintenance of such features as solar panels and green roofs. Secondly, although housing costs in western New York are already incredibly affordable, low employment rates still create a struggle for many residents. Many vacant buildings in the downtown area could be converted to co-housing sites. Also, providing grants for small business owners to help them convert to renewable energy and conduct green-feature renovations would make the daunting and expensive task a little more appealing. Funding for such projects could come from fines from the pollution of Lake Erie, for example. I was especially intrigued by the seemingly-insignificant but successful Green Numbers Program (“Die Grüne Hausnummer”) mentioned in Beatley’s chapter. In Buffalo and the surrounding suburbs (as probably in most cities and their suburbs), it is not uncommon to see stickers in business’ front windows saying “Chamber of Commerce Member, 2007” or “’Walk the Village’ Site” or “Downtown Small Business Partnership Member.” These are often used for “bragging rights” or just to attract the attention of passers-by. The Green Numbers Program seems like it would be successful in Buffalo, with businesses implementing green features to amass points that would earn them a plaque to display. This would complement nicely the new form of competition that is emerging with public awareness campaigns for buying green/local. Lastly, regional green energy projects would be far more effective if they benefited regional residents directly. Anecdote: as a part of my job this summer, I conducted wetland mapping with an environmental consulting firm that was hired by Noble Environmental Power, a power company constructing hundreds of wind turbines across a nearby rural farming county. When asked by friends and family members about the development, the first question was always “who does the power go to?” After explaining that the power is generated, collected, and sent to the national grid which “distributes it all over,” I received grimaces. People were angry that their pristine land and the land of their friends and family was being used up for the construction of windmills (let alone the years of being contacted again and again by the energy company and allowing people from another firm walk all over their land looking for wetlands), yet they didn’t “see” any of the power that was generated. I gained the sense that these people would be FAR more interested in buying renewable green power from this company if they knew that their local sacrifices showed more of a local result. I feel that this might even be more important that financial incentives and tax breaks. 3. Meeting to Discuss our findings with stakeholders; to explore what community gardening has been and what planners and policy makers want it to be? Survey: What information are we gathering? Access (transportation, walking distance, joining)? What questions matter? Are there differences between “Grassroots” community gardens and those that are city-supported? Are community gardens basically invisible? Why are community gardens invisible? 2. Community gardens don’t want to be invisible, but there is a set of constraints or problems that make them invisible (outreach challenge). 3. Community gardens aren’t really invisible, we just haven’t discovered how they’re seen through this process or approach. 1. Community gardening is part of sustainability and green cities. Next steps: survey people about their knowledge of the gardens: are they aware? Map gardens using concentric rings (1 block, 3 blocks, 5 blocks…) and plot areas of awareness. Where is your closest community park? Where is your closest community green space? Where is your closest community garden? --- Want to see: How the public differentiates (if at all) between these three items, how that plays into visibility, and whether the public considers community gardens to be green space. What is the street intersection closest to your home? ***these questions must be answerable for those who are unaware of community gardens nearby. Could develop a second survey to administer to those who seem aware of nearby community gardens to obtain more information about their impressions of the gardens. Could try to get garden member’s addresses from community garden leaders. While reading, I noticed a couple of housing policies that stood out as having a high potential for successful application in the United States. Throughout the course we have talked about the importance of changing mindsets. I believe the difficulty of achieving this can be overcome by building on the values and practices Americans currently hold dear. For instance, there is a strong tradition of competition in this country, one that would aid in the implementation of a program like the green house numbers mentioned in Beatly. The push for green living is starting to catch on in the states, and companies are beginning to boast about the sustainability of their products and fair practices. Why not take this to the next level and have businesses compete through their headquarters buildings? I could see the Baltimore Legg Mason building or the Wachovia headquarters revamping in order to obtain a green plaquard- especially if they would receive the type of media and governement attention that takes place in Europe. Government buildings leading this act would also be important. For example, the Ravens stadium is owned by the Maryland Stadium Authority. If stadium patrons and viewers at home were aware of the fact that the stadium is powered by solar panels, then chances are that would get them to be a little more consious about how they get their energy (and having an institution like a football team going green would help to dispell the myth that environmentalism is only advocated by liberals). I really liked the idea of green mortgages and bonds as well. Rather than our government spending money directly to install green systems for commercial buildings or private homes, it is simply forgoing the tax revenue they normally receive on investment earnings (which is a strategy used in a number of different community revitalization programs- ie, tax credits for restoring a historical building). Plus, people love taking advantage of tax free oportunities- my dad legitimately gets excited about donating our old clothing and recreation equipment to Salvation Army because he gets to write them off when he does our taxes. If we can emphasize the long-term benefits of installing energy-saving devices combined with the opportunties to take advantage of tax breaks, we can be a lot more successful in marketing these tools to your run-of-the-mill suburban home owner. Of course, while these policies have major implications for getting the upper middle class and business elite involved in sustainability, they can also be used to generate social justice as well. For instance, as a part of the green mortgages program, the government could stipulate that a certain percentage of funds must be reinvested into affordable housing projects, low-income neighborhoods, etc. It is vital to think about sustainability from the beginning of a project. After a building is constructed, enacting energy saving measures only takes a small chunk out of the energy usage. When energy was cheap, builders and architects didn’t need to think about efficient ventilation and lighting strategies. Any poor design was more than met by hyped up ventilation and cooling setups. Now that energy prices have begun to climb and energy shortages have become a problem, designers and architects have started to change their strategy on building design. It seems foolish to think that buildings are designed to only take advantage of a plot of land in terms of esthetic values and pay no particular attention to spatial orientation. As the sun moves through the day and through the seasons, it strikes different areas of a building and with differing intensities. Devices such as sun shelves are able to project this light a considerable distance into a building’s interior and by using highly insulated windows, do not bring with it the added heat. During the winter months, this light could be used to shine on dark surfaces such as a dark stone floor allowing heat to be stored in the floor and aid in heating the building. During the summer, this sun could be aimed at a certain part of the roof to create updrafts which pull warm air from inside the building and provide a means of naturally ventilating the building. These examples of passive solar are fairly easy to implement, but must be thought about at the onset of a home, and just by taking advantage of the sun, a building could potentially cut its energy usage in half. Beatley brings up a slew of examples on how Europeans have begun to implement sustainable aspects into new building design. It seems a shame that Americans have not jumped on this same trend. European policy makers have seen the same trends in energy usage that have been realized in the US, but instead of addressing rising energy demand by increasing supply, they have fought the rising demand through efficiency. Highly subsidized and publicized programs promote the use of energy efficient homes that take advantage of passive solar as described above. To curtail car usage, many cities have enacted high-speed bus loops and tram service which greatly exceeds even the best public transportation systems in the US. Not only does this prevent traffic from excessive car usage, but the cities are seeing reduced road maintenance and fuel use as well. Beatley sums it up very well saying, “There is simply not enough attention given in the United States to aggressively promoting ecological design and building.”(313) The United States is more interested in keeping everyone happy and blissfully ignorant as it pumps money into oil and auto subsidy programs make it seem as though there are no emerging energy problems. European countries have taken the energy issue head on and along with their powerful building programs are leading the way in sustainability. Though the United States has slowly begun to realize that it is getting left behind on this issue, the few projects that show this awareness are greatly outshined by the poor building practices of the past. Hopefully, the new architects and engineers will change this way of thinking and soon surpass the Europeans in sustainability, making the United States the hallmark of sustainable design. Oops, seems like I might have gone a different way than most. I read Edens Lost and Found, the chapter on Philadelphia (my hometown). Many points were brought up which lead back to previous topics, as well as bringing up many new ones as well. For me it was interesting to read about the events, places, people, and organizations I grew up around knowing, and understanding them deeper.The chapter discusses the decline of Philadelphia as well as it's possibilities and positive actions being taken all over the city. The chapter begins by displaying the Philadelphia flower show and its side project Philadelphia green. The Philadelphia flower show is an event which occurs once a year and creates massive displays of both flowers in artistic arangements (see above) and flower gardens. This is an interesting program because it covers multiple tactics. Most importantly the flower show does not work completely to educate, but mostly to amaze. And what better way for people to see the benefits of green in the city? Green Philadelphia continues this program by taking proceeds from the show and using them to create green spaces in the community. However they do not create spaces unless at least 85% of the neighborhood or block wants it. They they have everyone contribute (about $1). This functions as a commitment of the community to keep this space, it makes it theirs. It seems important to consider when doing any type of planning for a city to become part of the city instead of reaching to educate, or to recreate as Register would desire. Another interesting point the chapter brought up was how Philadelphia is a city of neighborhoods, and the work is often done neighborhood by neighborhood, block by block. Once again we see the importance of bottom up activity, as well as starting small instead of attempting large scale restructuring which displaces people and communities, while putting in large risks which often fail. We also see how the work can be a slow process, but that doesn't mean it is not moving. Philadelphia is an example of cities that is working to solve it's problems through the benefits of of nature, not solve it's problems of nature. The West Philadelphia initiative is working to add green space and trees to the city, which in turn creates increased aesthetic value, causing more people to see the city as a viable place to live and therefore increasing density.What was most interesting to me was the use of art in sustainability. In a culture that is plagued by sprawl, privatization, and loss of communications, art has the power to unite and recreate community. Philadelphia has many mural programs which range from those created by artists, to children, to prisoners, all in different neighborhoods of the city. The murals often reflect some aspect of the community, creating community pride and an increase in people staying. These murals can also beautify the community without leading to gentrification. One of the things I was struck by and disappointed with was how the book glossed over some nice little details of the past. For instance it mentions the West Philadelphia Initiative, a part of the University of Pennsylvania as being a revitalizing force of West Philly. While this is true and the organization does work to create a better community, it completely ignores the fact that Penn completely destroyed a neighborhood (not exactly unintentionally either) in order to create university city, a transient area (think collegetown). In my opinion the organization does not do nearly enough to account for the damage it caused, or to account for the incredible seperation between the two parts or types of West Philadelphia, the poorer neighborhood, and that of students and professors. There is a double edged sward to this revitilization as we see prices increase. So once again (I know everyone is getting sick of it) I bring up my point of the real effect that green cities have on it's lower class residents? As I was reading Beatley's chapter 10: Designing Buildings and Neighborhoods with Nature in Mind, I was surprised and excited to learn about the Healthy House in Toronto. This house was built to demonstrate sustainable home building principles for Northern climates. Even though I most recently lived in Toronto, I had never even heard of the Healthy House before, but it sounded like a great example of sustainable building principles being put into practice. I felt proud that one of the few true examples of sustainble housing that Beatley could point out in North America was in my home town, but I was ashamed that I didn't know about it before this. I have often wondered how practical it would be to have a self-sufficient building in a Northern climate, but The Healthy House has shown that it can be done well. Of course, the house was built using as many local and sustainable products as possible on a vacant lot in a Toronto neighborhood that is close to public transit. The landscape features low-input gardens with edible plants, and all the home's appliances were chosen for their energy-efficiency. 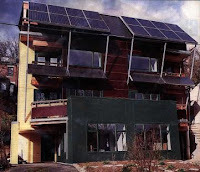 The heating and cooling system for the Healthy House uses passive and active solar systems, radiant solar floors, cogeneration, photovoltaic panels, super-efficient windows, air-tight super insulation, geothermal water circulation for cooling, and trellises of deciduous plants to provide summer shade and winter sun exposure. One of the most impressive feats of the Healthy House in Toronto is its ability to treat and recycle waste water on-site. All the water used in the house is collected from natural precipitation and stored in a limestone cistern. Thanks to a basement composter and water filtration unit, household water is recycled as much as five times before it is slowly released back into the soil in the garden. (www.cmhc-schl.gc.ca/popup/hhtoronto/htg.htm) Even toilet waste is effectively composted in the basement and grey water purified through a mix of microoganism digestion (including worms), oxygenation, ultraviolent radiation and charcoal filtration - anyone looking for more information on how this system works should check out healthyhousesystem.com/theory.html. According to the Healthy House website, the system "can reduce water consumption by up to 90% while allowing users to maintain modern consumption patterns." The house's composting and water systems attempt to mimic natural composting and water filtration systems. This is yet another example of how, by paying closer attention to natural ecological systems, we can increase the efficiency of our urban built ecosystems. Not only do the natural systems work well, they also require little to no power inputs in order to function. How much would a house like this cost in the real world? According to the designers and builders, any home could be built to function like The Healthy House at a cost of around $120/square foot. This figure is apparently equal to the low end price for a custom-built home in Toronto. (www.eyeweekly.com/eye/issue/issue_03.06.03/city/houses.php) The Healthy House isn't that expensive to build, it can start to pay you back right away in surplus power and energy-efficiency, and it can serve the inhabitants in the same way as a regular home, but why aren't more of these types of homes being built? Some of the other blogs discuss what many European countries are doing to encourage this type of building, but Canada and the U.S. still have a lot of catching up to do. When I was a senior in high school, I was able to visit an architectural firm. This was no regular firm; they specialized in sustainable architecture and worked out of a retrofitted post office. The building had been salvaged after a minor fire and the post office had moved onto another building. The architects redesigned the building to satisfy the highest level of LEED certification. There were solar panels, grey water treatment, rain water catchments and a green roofs featured on top of their building that was is the process of being built when I got to visit. Inside, the floors were made out of fast-growing bamboo. The walls and office dividers were made out of those compressed hay panels that Beatley talked about in his chapter. The architect’s desks were recycled doors from the original post office. All of the appliances were EnergyStar and the bathrooms featured low flow toilets and sinks. The paints used were all ecologically friendly and as I remember their furniture was made out of recycled materials. With so many recycled products in the office, it would seem like a pretty shabby place. However, that was not the case at all. If the architects hadn’t explained the energy efficient assets in their office I would have thought that everything was brand new. What’s more is that they used their office as an example for their clients—so that they could see that sustainable building practices were attractive and cutting edge. They also encouraged their clients to choose local or recycled building materials in the designs for new buildings. In this way, they were not only able to put their principles into practice, but also influence other major community stakeholders to incorporate sustainable practices into their business. As the chapter in Towards Sustainable Communities states, “improving livability and fostering community is imperative for the survival of humanity.” Indeed, if we are to avoid potentially disastrous consequences of our negative impacts on the planet, we will need to learn how to be more effective as communities that synergize rather than separate. The chapter on housing and community development shows many examples of and tools for affordable housing and community development. In Ithaca, a city surrounded by many communities, can benefit from the intensification of development in existing areas. With urban sprawl on the rise, this must include imposing barriers (such as higher taxes) to new developments in undeveloped areas and providing tax breaks for new developments in the city. In order to meet housing needs for lower-income people, Ithaca can fund the development of new affordable housing units near the city center. Making such developments accessible to the city center is important in ensuring a good quality of life for city members. In addition to tax breaks, Ithaca can further encourage affordable housing development by providing low-interest loans, assistance in forming housing associations, and resources to develop community land trusts. Ithaca can also work with volunteer organizations and examples like Eco-Village to promote replication of such housing units. Finally, to promote community, cooperative housing, urban cooperative blocks, and programs that bring residents together can be enticed. The chapter on building designs in Green Urbanism looks at the great examples that exist in Europe of sustainable building. In northern European countries, building complexes are designed to reduce energy use, increase density, and maximize resource use and availability. From Ecolonia to Morra Park, examples of ecological building abound in Europe. Most of them make very wide use of solar energy for both electricity, lighting, and hot water. In the Netherlands, especially, the government itself sets national targets for achieving bold reductions in energy use and sharp improvements in resource efficiencies and high density. The government funds several programs that involve the public and private sectors, encouraging collaboration and incentivizing higher sustainable building standards. While there are many examples in the United States, few are as impressive as the examples in Europe, where high density and full utility of solar energy, energy efficiency, and open space are very common. The challenge for the United States is to build the capacity for radically different building standards and to create policies that will discourage energy and resource waste in buildings and encourage density, green design, and efficiency. As I was reading Beatley and the New Energy for Cities booklet, I was reminded of the U.S. Green Building Council’s various LEED programs, and especially their Neighborhood Development pilot program, which is being tested now and will probably be adopted in 2009. LEED-ND, as it’s called, was informed by green buildings practices in general and the past successes of the LEED programs for individual buildings, but was also guided by the Congress for the New Urbanism and the Natural Resources Defense Council. Quoting from the program overview: “Unlike other LEED products that focus primarily on green building practices, with relatively few credits regarding site selection and design, LEED for Neighborhood Development places emphasis on the design and construction elements that bring buildings together into a neighborhood, and relate the neighborhood to its larger region and landscape.” Like other LEED programs, LEED-ND has some baseline prerequisites for certification, but then offers a menu of other options that can be incorporated for extra points, earning the building a silver, gold, or platinum rating. Rather than reflect on a program which few people may know about, I’ll summarize the program below. Projects get no points for the required criteria, but can earn up to 106 points for meeting combinations of the optional criteria. To be certified, a project must garner at least 40 points; projects earning more can qualify for silver, gold, or platinum certification. The standards themselves are fairly objective, for instance, many of the transit-related criteria rely on Vehicular Miles Traveled calculations. Brownfield redevelopment, ecological and wetland conservation, and ag land conservation all hinge on existing government standards and classifications. The LEED-ND Core Committee commissioned a study last year about the public health implications of the program. While not an appraisal of LEED-ND per se, the committee used the findings of the report to shape the ND criteria to reap the greatest public health impact. The report had a strong EJ component to it, addressing the impacts of neighborhood location on special populations such as women, the elderly, children, and low-income households and also discussing how social capital is accrued and leveraged within a community. For reasons to support smart growth, this report is excellent, giving substantive reasons for reduced vehicular travel ranging from fewer incidences of asthma and car-related injuries, to improved physical fitness and mental health. In one way or another, almost every aspect of green cities that we have discussed in this course is encompassed by the rating system. It would be interesting to rate some of the projects described by Beatley in Chapter 10 and see how they fare with the LEED-ND certification process. Perhaps they could serve as benchmarks for some of the projects that are currently part of the pilot program in the US and Canada. 120 projects were admitted into the pilot program, but there are currently more than 220 projects across North America that will be seeking certification when complete. I had the chance to meet the developer of one of the projects this past week at the Urban Land Institute fall meeting in Las Vegas. Dockside Green, located in Victoria, British Columbia, is aiming for Platinum certification. The website touts the project’s sustainability as follows: “A model for holistic, closed-loop design, Dockside Green will function as a total environmental system in which form, structure, materials, mechanical and electrical systems will be interrelated and interdependent - a largely self-sufficient, sustainable community where waste from one area will provide fuel for another. Here you will find a dynamic environment where residents, employees, neighbouring businesses and the broader community will interact in a healthy and safe environment, reclaimed from disuse and contamination." As we have said numerous times throughout the semester, holistic approaches are the key to sustainable development. In order for a city (or any community) to stand the test of time and live lightly upon the Earth, it must understand the complex processes that govern its life. We must continually return to this truth as we consider the future of Ithaca and any possible changes that we would like to make in the city—especially changes that deal with Housing and Community Development. 1) Although we cannot force residents to interact with one another or build community, we can certainly build upon existing infrastructure to encourage interaction. One useful strength might be the extensive network of programs within Ithaca that target children and their families (sports leagues, after school programs, community centers, schools, etc.). Perhaps if Ithaca’s children get involved in the community, then parents will have no choice but to follow their example. In practice, we might intensively promote existing youth programs within Ithaca and then follow up by targeting the parents of the participating children. Not only could we generate a lot of rhetoric about community development, but we could also branch out from the youth programs and start offering comparable programs for adults. These programs could serve both recreational and practical purposes. For example, parents with extra time might get involved with an adult sports league while those with less time might benefit from cooperative childcare and carpooling networks. 3) Looking more at affordable housing, Roseland provides many ideas for generating long-term (and even permanent) affordable housing. I particularly like the idea of sponsoring community land trusts within Ithaca. Such trusts purchase land at market value, remove the land from the market, and then use the land for affordable housing, public facilities, or some other meaningful cause. After construction is complete, the trust takes care of the land and monitors upkeep. Beatley points out some practical programs that seems to be working in cities such as Boulder (Greenpoints) and Austin (Green Star Builders) as well as the Green House Number program in Germany and could fairly easily translate to other cities around the US. These programs seem similar to the more rigorous LEED Certification, which seems to have become somewhat of a badge of honor in the design/build community. Many of Beatley's points about America's increased housing size are still valid, however even since the book's publication in 2000, I think there has been a pretty dramatic shift towards green building here in America. One point Beatley made was that in some cases material that is thought to be energy efficient or environmentally friendly is made less so when taking into account the concept of "embodied energy." Beatley brings up the shipment of western red cedar from Canada to the Netherlands to construct new homes with wood that can remain untreated. Beatley doesn't address embodied energy in his book but basically it is the idea that when you use a product or material you should factor in the costs (both monetary and environmental) with its construction and transportation. If you are interested in architecture and building it is important to know about because embodied energy is also used as an arguement for capturing the existing resources in and on our already developed land. So when you rehab an old building you are capturing the resources that went into all the materials, as well as the energy embodied by the workers that constructed it. 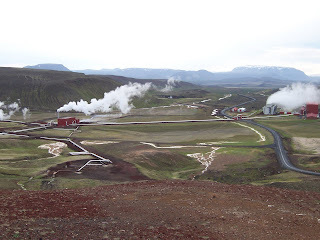 Often times buildings older than 75 years old contain more green features than buildings built in the last 50 years because they were constructed with natural materials and constructed to have natural heating and cooling systems before everyone went HVAC crazy. I believe the USGBC still has not released their LEED rating system for existing buildings but I know it is in development and will rate existing buildings for the inherently green features if they exist, as well as for green features which are retrofitted. Combined with the substantial state and federal funds available for the rehabilitation of old buildings, a LEED rating system for existing buildings would create a powerful tool for restoring areas that were built basically applying smart growth principles before there was smart growth. So, enough of my preservation rant. I appreciated the Roseland piece on Housing and Community Development very much. Roseland addresses realistic issues such as affordable housing, infill housing, brownfield development, the greening of urban areas and then offers examples of these issues being addressed in the US. In trying to keep with the assignment, I thought about, as I usually do, Pittsburgh. Reading Roseland's list of ways to address affordable housing I thought a lot about how many of the tools, such as Affordable Housing Programs like Habitat for Humanity already exist in Pittsburgh and unfortunately still aren't able to adequately address the issue. So I tried to focus on what we were missing that might help to close the gap. The first thing that jumped out was linkage payments. Roseland mentions them in Boston, and I just hears a talk by the Boston URA on their effectiveness. Great! Linkage payments in Pittsburgh! Actually, this would not be something that a smaller rust belt city can afford. The city struggles to attract developers as it is, and a linkage payment would deter not entice. Perhaps other municipal funds, or portions of other developer fees could be set towards affordable housing but I don't believe a linkage payment would be appropriate in Pittsburgh. What I did come up with was that when affordable housing is built it should be more service oriented, to empower residents. Additionally, a more large-scale tool might be the establishment of a land trust just to promote and protect affordable housing. With the highest number of foundation dollars avaiable per capita of any US city, Pittsburgh's foundations could support the land trust initially if it received donations of land from the city. Certainly something to be further explored ... unfortunately probably not by our 27 year-old mayor. Beatley Chapter 10 gave many great examples of how European cities are building and renovating their residential and institutional properties using eco-technologies. One really important concept from this chapter was how eco-building can spread to new cities once it is implemented and tested by another city. For example, Ecocolonia, Netherlands built a new development using eco-technologies such as green roofs, passive solar technology, recycled building materials, and solar hot water heating units. This development served as a testing ground for many other cities that begin using the technologies that Ecoclonia found successful. I believe that if a few US cities really started to adopt these new technologies they could educate and show other cities that it is possible. Another idea for the US would be to build new government and public buildings using green methods. This would show the people that the US really supports and feels building ecologically is important. The Apollo Alliance chapter on High Performance Buildings talks about implementing green building standards for public buildings. An American city that uses a green buildings standard for public buildings is Seattle Washington. Seattle Washington requires that all city projects over 5000 square feet must meet LEED standards. The Apollo alliance also give some ideas on how to make green building more attractive to the private sector. Using property taxes, grant programs and other incentives all make green building more enticing. In Arlington, Virginia the government said that if a company builds LEED certified building they will modify some of the zoning regulations and allow height increases. Incentives programs like these could really change the way America builds, because it encourages green buildings. My interest in green building is what initially drew me to take this course. In my upcoming career path of architecture and interior design, the topic of green building is one that can not be avoided and for good reason. I am a member of the USGBC so many of the facts that i will be discussing in this blog come from them. It has been reported that worldwide buildings account for 17% of fresh water withdrawl, 25% of wood harvest, 33% of the CO2 emissions and 45% of the material and energy use. With these kind of numbers it is no wonder that people are getting more excited and more interested at the prospect of green building. As with all areas of sustainability green building involves many peoples interest not just that of the architect or designer. A successful green building involves the building owners, financial representatives, building tenants, utility manager, architect, planners, property manager, all levels of government, product manufacturers, contractors, engineers, interior designers, landscape architects, code officials, and more. The LEED (Leadership in Environmental and Energy Design) was a great way of getting people involved and excited about green building. By having a building accreditation system people have a strong incentive for getting a project certified the main reason is for publicity and recognition. The LEED system assesses design in site planning, water management, energy management, material use, indoor and environmental air quality, and innovation in the design process. Obviously this is not all that goes into sustainable design, but it seems to be a very comprehensive and yet approachable system for green buildings. The USGBC reports that if implemented correctly their LEED system will provide a 9% decrease in operating costs, a 8% increase in building value, a 7% improvement in ROI, a 4% increase in occupancy, and a 3% available rent increase. From an building owner and operator's perspective sustainable building has been proven to raise performance tests in schools by 20%, decrease the average length of stay in hospitals by three days, increase the sales per square foot in retail spaces, increase overall productivity in factories, and lead to an average 2-16% productivity increase in offices. I wanted to find one of my favorite LEED projects to talk about but instead i decided to find if any buildings in Ithaca were LEED and to my surprise the tompkins county SPCA is a LEED certified building. This project consists of a new 9,900 ft2 (920 m2) animal adoption center for the Tompkins County Society for the Prevention of Cruelty to Animals (SPCA), a minimally renovated 4,000 ft2 (370 m2) building as an animal intake and evaluation area, and a bridge connecting the two spaces. Dogs and cats (the primary center occupants) have separate wings in the building, while the central area houses staff and community rooms, a treatment and surgery suite, and other support spaces, including the laundry and grooming rooms. The project was landscaped exclusively with native trees and grasses, and no permanent irrigation system was installed. Runoff from the parking and roof surfaces is channeled through a series of swales into a filtration trench and detention pond designed to allow stormwater infiltration. Efficient fixtures reduce water use indoors. Energy-saving features include a geothermal heat pump, a narrow building footprint conducive to natural lighting and ventilation, efficient light fixtures, and heat-recovery ventilation. The indoor environment is enhanced through operable windows and 100% fresh air in animal spaces. All paints and finishes used in the project contain low or no emissions of VOCs, engineered wood products contain no added urea-formaldehyde, and carpets meet Green Seal standards. FSC-certified poplar was used for exterior siding and interior ceilings, and recycled-content materials were used when feasible. Seattle Washington, Taking a BiG first step. I am personally very interested in Green, LEED certified buildings so after reading the Apollo Alliance and saw what Seattle Washington has been doing with their current development I’ve decided to do a mini Case Study on it. In the past couple of decades, Seattle has been able to involve both community, residential and government buildings in programs promoting Green, Sustainable living. This has evolved into an integrated system of justice, renewable energy and sustainability. The Seattle Justice Center is a true model of sustainable development. This is a civic center for the community that has been designed to comply with LEED Silver standards. This is a result of Seattle requiring “all city-funded projects over 5000 square feet to meet LEED Silver standards.” This is facilitated by the Green Building Team of Seattle compiled of city employees who “act as resident experts on elements of green building”. These three elements are all interconnected as they assist in reducing heating costs through various methods. The glazed thermal buffer wall is a double glass plane that has air buffering the inside of it from heat gain or loss. It also allows for natural light penetration. While the glass sides help decrease heat gain on the side of the building, the roof garden prevents heat gain at the top. The roof garden is watered by the water harvesting units which helps decrease water expenses. 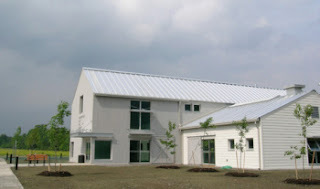 The city believed that it would be a good idea to make the community center sustainable so that the entire community is touched by an environmentally friendly atmosphere. This hopefully spreads to the rest of the community and people will begin enacting these sustainable measures in their own homes. Seattle also has adopted the “Washington State Energy Code” which is considered to be one of the best energy building codes across the country. It is considered better and even stricter than the IECC (international energy conservation code). Often it is a problem getting the public involved which is why Seattle brought green building technology to the civic center. Recycling bins are everywhere in the building to enforce this environmentally friendly practice. Seattle Washington has done many impressive green projects over the past several years and I will expect to see much more of them in the face of Sustainability in years to come. This week I read the Beatley pages (Chapter 10) and the Apollo Alliance pages (13-27). I found these interesting and informative, with some great ideas. There are also some issues I think need further discussion. Below I'll first list the most exciting ideas from a planner's perspective, and then talk a little about the implications and issues I see coming up. 1) I think it's exciting to know that by putting computer monitors on sleep mode if they're unattended for more than ten minutes can save a city approximately $13,000 a year. (Apollo report, p 14) This is an incredibly simple action that anyone who owns a computer can do. It's something that is easy, and you can even just set the computer to do it, so people won't even have to pay more attention to what they're doing. So here's one simple step we can take, even for ourselves. 2) I like the idea of a Green Building Team like they've developed in Seattle, WA. I think it's great to have an interdepartmental team work on assessing green building in the city. A lot of the time, we are missing an interdisciplinary, holistic approach to many of these issues, and by addressing them in a one sided fashion, we open the possibility for everything to fall apart on the other sides. A holistic approach is a protection against this happening, and also makes the new plans more integrative and exciting. 3) It's amazing to me that in Chicago they dropped the roof surface temperature 70 degrees by creating green roofs. Wow! That is a lot of degrees, and I think green roofs are great because they can be quite simply constructed, they are clearly very useful in terms of energy efficiency, and they can be aesthetically pleasing--something we might consider more in our designs. -along with that, I like that the city offered $5,000 grants for the construction of the roofs. It shows honest and practical support on the part of the government, and show they aren't wind-bags. 4) Expediting permit review for greener buildings also seems like a good idea. It makes the process easier for those already committed to that type of construction, and at the same time encourages others to consider the idea, if only by poking them a bit. 5) This one is similar to the idea of putting computers on sleep mode. If UB spends an extra $100,000 if the heating or cooling is off by 1 degree, this is also a small step to saving loads of money and energy, and it makes you realize how much difference one degree more or less can make. It makes me feel like I want to be more considerate about heating my own home too. 6) The idea of De-coupling is cool. It's maybe a bit socialist for the US, but maybe it can be presented in a better way. It's great though to disassociate profit from providing basic needs to people. This seems like an important philosophy that can be applied in other areas as well. 7) I like the idea of an ecological demonstration project. People want to see it to believe it. They need a concrete experience of what some of these semi-strange ideas are all about. For lots of people this is so far from their everyday experience; I think in the US this, coupled with respectful marketing, would make a big difference. 8) I like the emphasis on education in the Scandinavian countries. It's different from brainwashing and might get people's minds working, so that we could develop even better and way more relevant ideas for people. 9) The Green House Numbers is a neat idea. It's a little childish, but kind of sweet just the same. I'm uncomfortable talking about the "powerful roll government can play" in the context of the United States. I think our political process is (fatally?) flawed, and dangerous. I think there is very little actual representation of what the public choice includes, and I don't think it's healthy to think that a few environmentalists lobbying like hell would be an OK thing. It might make some changes, but I am still absolutely convinced that unless there is a consciousness shift, MUCH better education system, a MUCH better (hell, existent) health care system, a lot of attention to equity and justice issues that go unexamined most of our lives, unless we have to face them everyday, etc etc, you get the idea. Well, none of this will ultimately make any difference. Also I'm not sure about the idea of legislating an zoning, not only because there is serious under-representation in the government, but also because it's not very inventive or revolutionary, and certainly not relevant to the people to simply legislate that they live in an ecological manner. There is certainly an element of urgency that comes with issues of the environment, but if we are truly thinking in a seven generation, systems type of way, we better consider more than telling people what to do.